Tired and journeying to and from the gym, queuing for your favourite machines and paying over-the-odds for membership? Beast Sheds have the answer. Why not bring the gym to you? Our range of gym sheds are spacious and strong, sitting at the end of your garden and providing you with a custom-built space for you to host your own gym equipment that is accessible the moment you step out of your door. No more peak times, no more crowded weights rooms, no more personal trainers trying to make you feel inadequate... just your own personal, private garden gym where you can hone and tone your body in your own time. The garden gym sheds are available in a myriad of sizes that will suit all gardens, whether you have an expansive stretch of grass to fill or you’re trying to maximise your space in a small outdoor area. If you’re a gym fanatic with plenty of equipment to cram in, you’ll be wanting a larger shed that will house your fitness gear. If you’re just starting out with a treadmill and a rowing machine and you want to work out away from the hustle and bustle of the house, a smaller shed makes the perfect solution. If you want a gym that is available 24/7, with no subscription or membership, no lockers with dubious locks and no familiar faces trying to chat while you are sweating it out on the treadmill, browse our range of superb garden gym sheds today. What makes our Gym Sheds perfect for a home gym? Our garden gym sheds are robust, durable and high-quality. The floors within are created from the renowned heavy-duty Beast flooring, which is strong enough to park a fully-loaded van on! Don’t worry about storing those weights or all that heavy machinery; the Beast floors can take it. The same goes for the walls, the roof and every screw and nail that goes into the sheds. The shell is made from robust, durable timber which will add a pleasing aesthetic to your garden. It can be colour treated or left in its natural state with a clear stain to add a rustic edge. Whether you have acres of space or a more compact outdoor area, the garden gym is compact enough to be practical while remaining spacious on the inside so you have room to exercise and move freely from machine to machine. 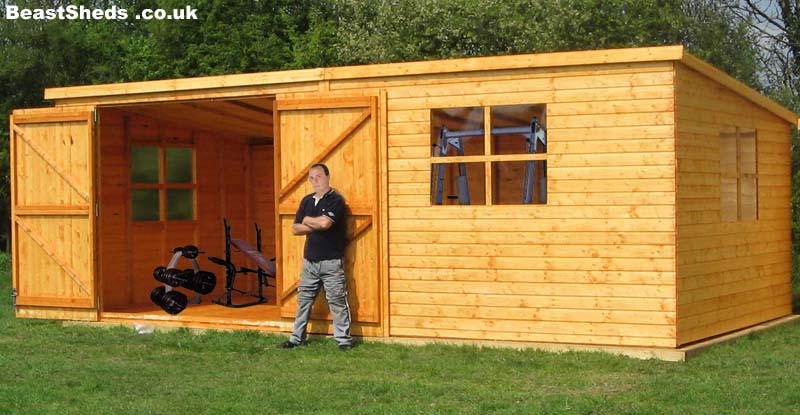 Our supreme quality gym sheds will improve the quality of your workout to no end, and with a fully-fledged fitness suite at the end of your garden, you will see results in no time. If you have a shed in your garden that is just taking up space or isn’t being used regularly, you can add some life to it by turning it into a home gym. Having a home gym makes getting regular exercise more convenient, and doing so in your shed makes better use of something that would otherwise go wasted. Here are some tips for turning your shed into a home gym.